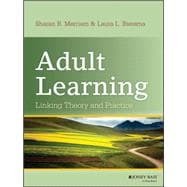 by Merriam, Sharan B.; Bierema, Laura L.
Sharan B. Merriam is professor emeritus of adult education and qualitative research at the University of Georgia, Athens. She is a four-time winner of the prestigious Cyril O. Houle Award for Outstanding Literature in Adult Education and is the author, coauthor, or editor of more than 26 books, including Learning in Adulthood, The Profession and Practice of Adult Education, The New Update on Adult Learning Theory, and Qualitative Research, all from Jossey-Bass, a Wiley brand. Laura L. Bierema is professor of adult education and human resource and organizational development at the University of Georgia, Athens. She is the author of several books including Critical Issues in Human Resource Development and Implementing a Critical Approach to Organizational Development.